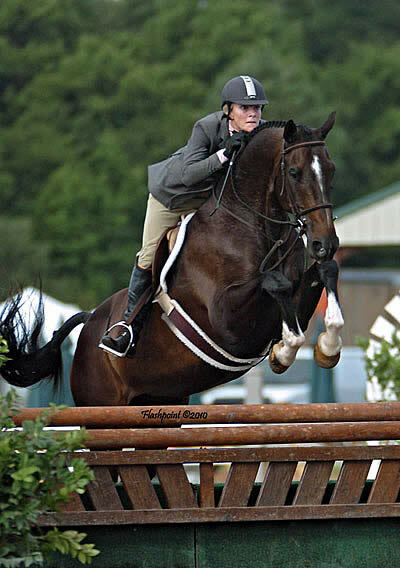 Hayley Barnhill and Red Panda won the 2010 USEF Junior Hunter Finals-East Coast Grand Championship. Photo By: Alyson Sanderford/PMG. Lexington, KY – August 4, 2010 – High temperatures made for an intense final day of competition for the USEF Junior Hunter Finals at the Kentucky Horse Park. Today’s classic round determined both Reserve Champion and Champion for each division, as well as overall High Point Mare, Reserve Grand Champion and Grand Champion. Today’s course was designed by Bobby Murphy and involved multiple bending lines, rollback combinations, a triple combination down the diagonal towards the in-gate, and finally a strong gallop to an oxer. Small 15 & Under Junior Hunters were first in the order of go and it was 15-year-old Caitlin Ziegler aboard Safari making a comeback from the Handy Round to receive scores 87-86-86 for a total of 259 and the blue ribbon in the Classic Round. Ziegler and Safari, an eight-year-old Hanoverian, earned an overall score 634.5 points, which was good enough to claim division championship. Shawn Casady and Scout, owned by Mattie Warsham, came out of the Classic Round in fourth and received the reserve championship prize with 629.5 points. Hanging on for third in the division was Meg O’Mara and Fernwalk, owned by Don Stewart, finishing with 622.5 points. Johns Island, SC — July 26, 2010 — The Charleston Summer Classics’ final week of competition at Mullet Hall Equestrian Center on Johns Island, SC found most attendees weren’t so anxious to head home, but rather thinking of extending their stay at nearby Kiawah Island and Seabrook Island beach resorts. Sunny skies and ocean breezes provided another perfect backdrop last week for not only competition in the arenas, but at area golf courses and nearby beaches as well. “We really have been fortunate with the weather here. With classes starting at 7:30 each morning many of the families have been able to hit the beaches by early afternoon and enjoy all this area offers,” Bob Bell of Classic Company said. © ESI Photography. 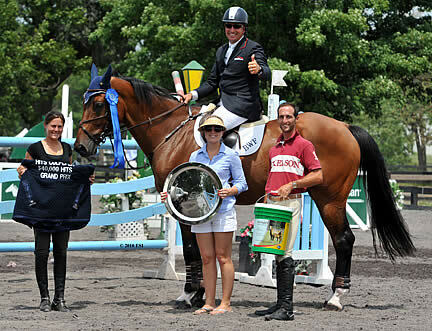 Grand Prix Rider Aaron Vale and Paparazzi 10 won the $40,000 Strongid C 2X Grand Prix, presented by Pfizer Animal Health. CULPEPER, VA (July 22, 2010) — The road to the Pfizer Million passed right through the heart of Virginia’s horse country for the HITS Culpeper July horse shows and saw two major contenders in the race for the top prize in the Pfizer $ 1 Million Grand Prix pull off a pair of big wins at HITS Commonwealth Park, in Culpeper, Virginia. Aaron Vale got the party started during the Showday National (July 7-11) when he rode Paparazzi 10 to the blue ribbon in the $40,000 Strongid C 2X Grand Prix, presented by Pfizer Animal Health, to climb into the top 15 of the Pfizer Million Eligible Rider Rankings for the big-ticket class that will take place at HITS-on-the-Hudson on Sunday, September 12.